It’s that time of year when your sweetheart is bound to be wondering whether you’ll make a commitment. We hope you do. And we also hope your intended is homeless! Many shelters offer wonderful Valentine’s Day adoption promotions, so this romantic holiday can be a perfect time to add a little unconditional love to your life. But if you’ve already found your true puppy (or kitty) love, here are a few other ways to celebrate Valentine’s Day while showing your love for the homeless pets that have not yet found their perfect match. While most of us can’t imagine life without our furry or feathered friends — dogs, cats, birds, horses — it is true that of all the companion animals, cats are particularly interesting because while most live with people, many make it on their own. While this is to be admired on many levels and is part of the reason that we adore our cats, it’s also a significant source of problems for your local shelter or cat rescue group. Many people are sympathetic to homeless kitties and put out food and even build shelters with plastic totes and straw bales. This is a sure sign of the generosity and compassion of the human animals. But this little leg up results in one very negative outcome. Cats living on the edge gain just enough health to reproduce. 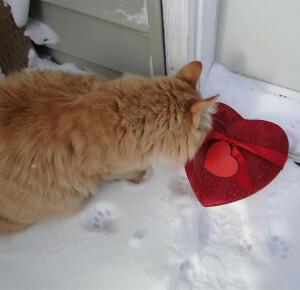 So this Valentine’s Day make a commitment to have your neighborhood cat spayed (or neutered). This can be done at low, or in some cases, no cost as long as you are willing to see that she (or he) can recover safely. It’s not too much to ask for a little rodent control and companionship. But most importantly, controlling the population of homeless cats helps wildlife populations and can stabilize the cat population. Altered resident cats do not raise litter after litter and have been known to keep other cats from collecting in the area to compete for resources. Think about it. If you are looking for a source for neutering services, find your local shelter or rescue group here. They can direct you to the programs that fit your situation. If giving a furry feline the “snip” doesn’t quite pass the romance test, why not see what your local shelter or rescue group has planned for the day? Many organizations use this holiday as an excuse for fun and festive fundraisers. One great example of a creative Valentine’s Day fundraiser comes from the pug-lovers at DFW Pug Rescue. On Feb 14 between 9 am and 5 pm, DFW Pug Rescue will deliver Pug Grams — a delicious candy arrangement in a vase with a choice of Butterfinger, Snickers, Kit Kat, Reeces Peanut Butter Cup or Variety pack, plus a balloon and a card with a special message from the sender. The best part? The Pug Gram will be hand (paw?) delivered to the recipient’s work or home by an adorable rescue pug, and will get his or her picture taken with the delivery dog. The photos will be posted on the group’s website and on Facebook later in the day. If this sounds like just the thing to brighten up your valentine’s Valentine’s Day, visit DFW Pug Rescue’s website for more information. Is your local shelter or rescue doing anything to celebrate the day? Tell us about it and we’ll help spread the word!